First introduced in the middle of 2015 the Galbraith and Paul Collection for Holland and Sherry brings together two (2) distinct, but interrelated worlds of savoir faire. By marrying together their individual strengths with their mutual values including a strong tradition of bespoke and custom work, favour of the subtle texture and variation of anything handmade, and an unwavering attention to detail and quality, the pairing of these two design houses has lead to the creation of a highly versatile, attractive, and dare I say, innovative approach to carpet making; one that specifically caters to the needs of the interior design community. 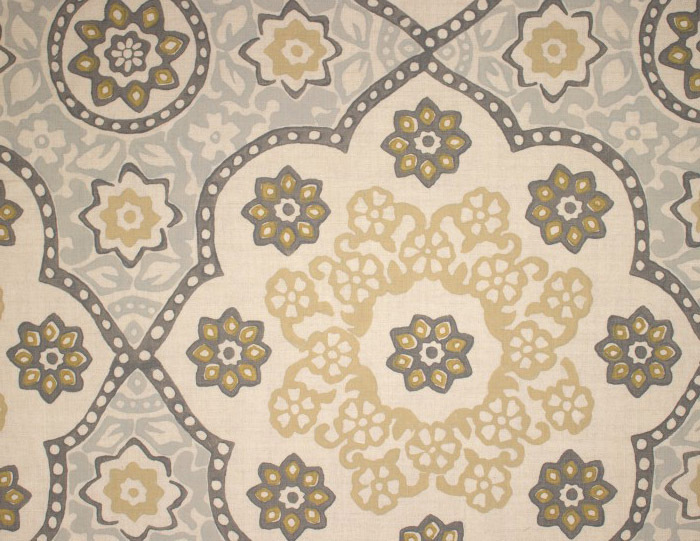 Over the course of several months spanning the later half of 2015 I spoke about the new collection with Liz Galbraith, obviously of Galbraith and Paul, and Kate Consiglio, Vice-President of Holland and Sherry‘s Rug Division. I personally reviewed a small selection of samples here at the studio, and during my visit to Holland and Sherry New York was treated to a comprehensive tour of the collection by Wayne Consiglio, Creative Director of the Rug Division. Given all of my professed love of the haute couture equivalent of the rug world, artistic license, and an appreciation for the crème de la crème of rugs, one could rightly guess I went into this with a bit of skepticism; for these are not after all rugs made by any one of the myriad of archetypical rug companies I usually favour. 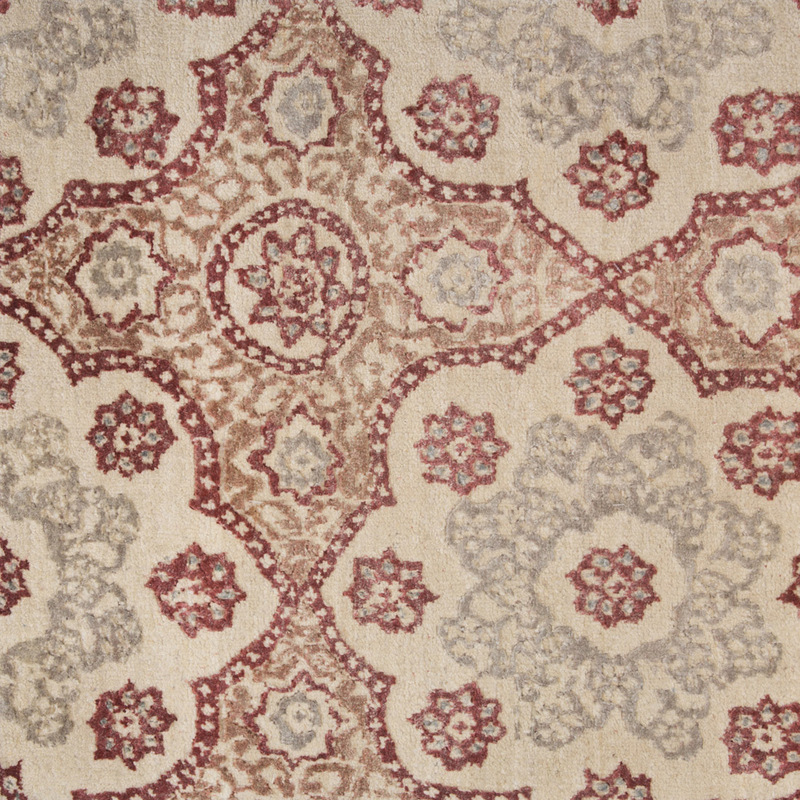 What they are however are well crafted – a word I emphasize and use deliberately to pay homage to a stunningly comprehensive understanding of making, in this case, rugs and carpets. Skepticism thusly checked, it’s a collection well deserved of the use of the term, for it provides designers a genuinely unique and easily implemented flexibility in their design process. ‘My mother made hooked rugs so I guess it all comes from the fact that I was raised with a strong maker tradition’ begins Liz Galbraith as we’re discussing the Galbraith and Paul Collection of Carpets at Holland and Sherry. 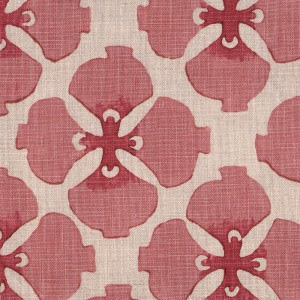 For those unfamiliar, Galbraith and Paul is a studio workshop specializing in hand block printed textiles and studio printed wallpaper available to the trade that has existed since 1986. ‘I studied painting in University and have always had an interest in textiles and knitting. Part of all that study is training the eye to see what is actually there (as opposed to what we assume we see).’ This know-how as we so uneloquently say in english, or more accurately the lack thereof when it comes to running a rug company is precisely what led Galbraith and Paul to abandon early thoughts of their own rug division. ‘It was too large of an undertaking’ Liz states expressing concern that the rug project would detract from their primary focus. Though Galbraith and Paul did dabble with rugs, it wasn’t until Kate and Wayne Consiglio joined Holland and Sherry, that all of the necessary savoir faire came together and the creation of this comprehensive collection began.‘It was very much a collaboration. There was a clear goal of trying to make the rugs have the same handmade, artistic quality that the fabric and wallpaper posses.’ says Kate. ‘Galbraith and Paul created the designs and colourways and we suggested the different qualities we could use to achieve the look they wanted. It was also important that the collection have a range of different qualities and price points.’ Consequently the entire collection defies definition solely as as rug collection, rather more as a design collection available as wallpaper, fabric, or rug. Often, multiple qualities of rug. 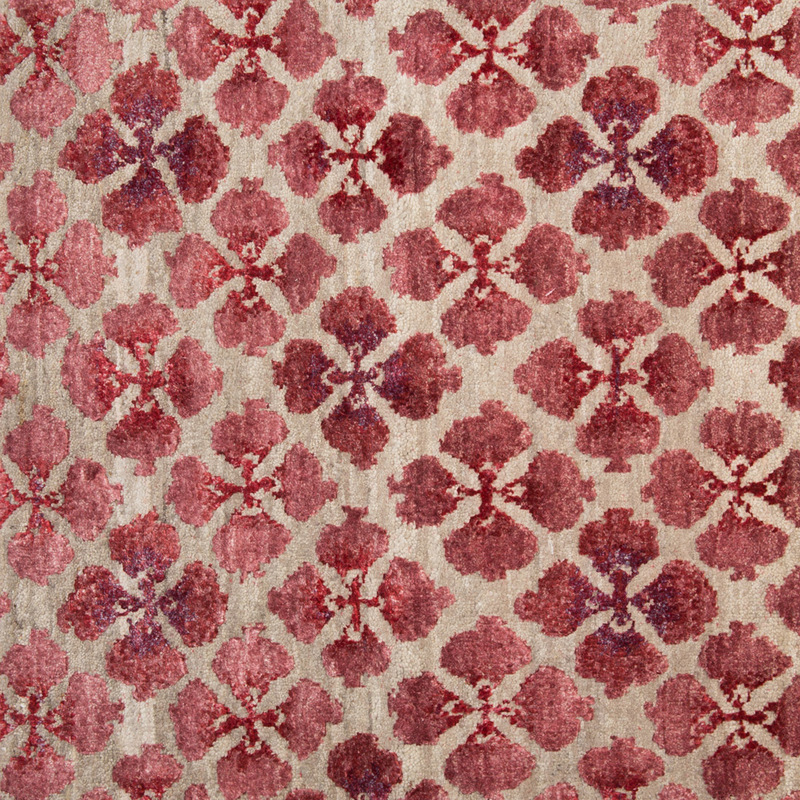 Take for example ‘Sakura’ as shown above in a lovely ‘Agua’ colouration Soumak weave – handmade in India of New Zealand wool. Owing to the constraints of the construction, the design takes on a slightly ‘crisper’ definition than that of the original design, shown below as both handprinted wallpaper and fabric. 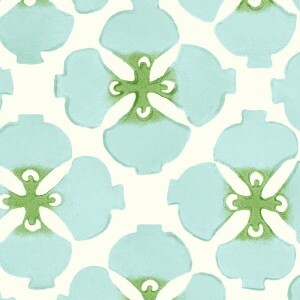 ‘When we are printing fabric (or wallpaper) there are all of these subtle handmade variations. Different pressures. Different techniques.’ Liz states while explaining how the designs are printed. In a rather successful attempt to mimic the ‘pooling of the ink and other details of the wallpaper and fabric’ Holland and Sherry turned, as many in the rug industry are once again doing, to Persian knot construction. 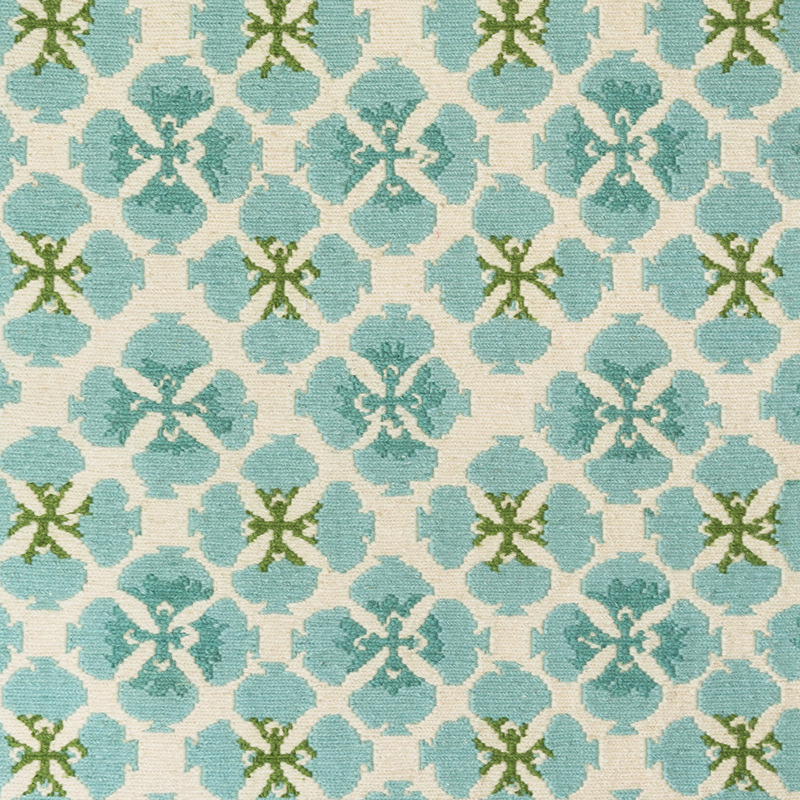 ‘The level of detail we wanted to achieve was only available in Persian knot.’ Kate states. The success of which, both in colour accuracy and in mimicry, can be gauged by comparing the ‘Sangria’ colouration of ‘Sakura’ fabric (above right) with the Persian knot carpet of the same description (below) – handmade in India at 9/9 quality of domestic Indian wool and Chinese Mulberry silk, both handspun. If you were to ask me, and we can assume you would because you’re reading this, I simply cannot find fault. Moreover, of particular note in this example is the deft use of silk and wool, contrasting gloss and matte that captures and embodies that mimicry so desired. Jonathan’s comment reminds me of my fresh from University days when I had just started selling rugs and carpets. It was the early mid nineties and I was soaking up information on rugs and interiors, buying monographs and pretending to be more worldly than I was. I had this self aggrandizing tome from some English designer whose name I’ve long forgotten and there, on page one, was just such a bedroom Jonathan described. Design worthy of note is timeless, and this collection – well designed in its own right – certainly has the potential to work at that level. ‘We are definitely pattern driven.’ Liz begins ‘Our patterning nods toward tradition but avoids being overtly ethnic.’ she says at some point in our conversation. 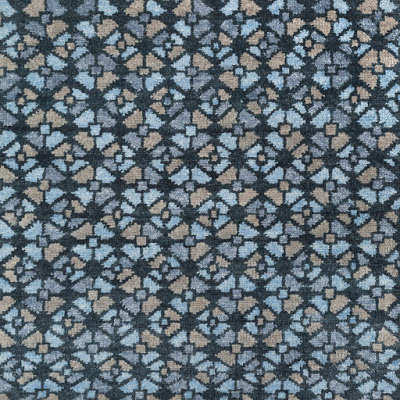 For example, ‘Seville Medalion’ shown above in colour ‘Sangria’ was inspired by imagery in a volume on middle eastern textiles. And while the influence is apparent, just as Liz and Jonathan state, it is not overtly any one style nor too obtrusive. It would be wise to also take note of the complimentary colourways between designs, rug, wallpaper, and fabric for these features, and their associated benefits, are the real standout element of this work. ‘Seville Medalion’ – shown here in a ‘Pewter’ colouration on linen fabric – illustrates what may be my favourite topic to explore in design; the interplay between colour/contrast and design. Squint while gazing at either colouration and the shapes you think you see change; a result of an adept understanding of positive and negative space on the part of the designer. This concept is perhaps better illustrated by the design: Trellis. Found in various disparate cultures the world over, the basic premise of flatweaves – warp and weft intertwined – gives every carpet made with this technique a certain hardness and geometry. Further, as a simple two (2) colour rug, we once again explore the positive and negative, and the ‘continuity between the spaces’ as Liz describes. 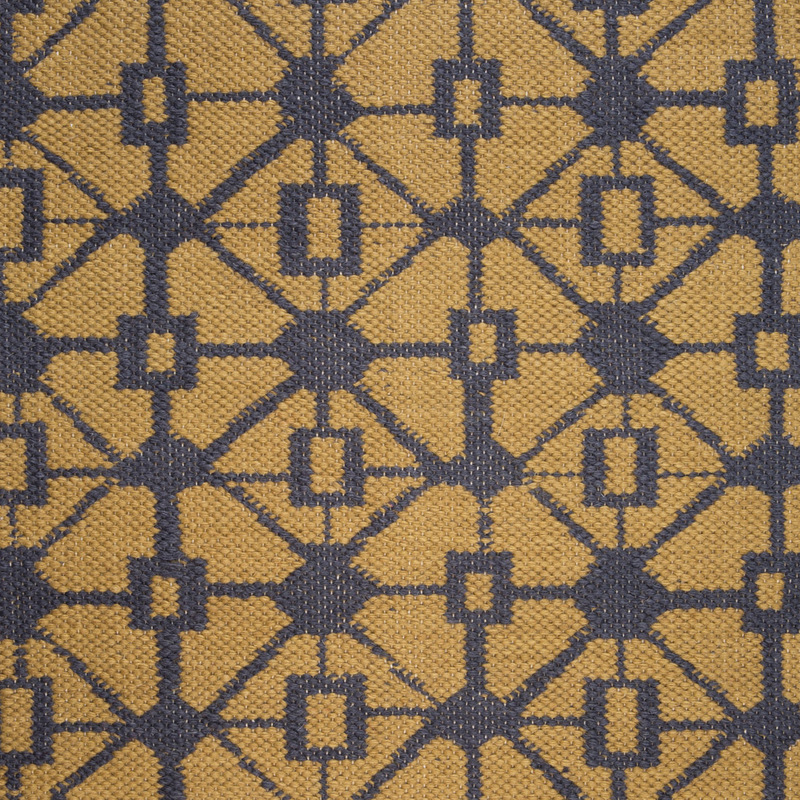 Translating the trellis design into a pile carpet brings added dimension and character to the piece, while at the same time further illustrating the use of colour and positive/negative space. 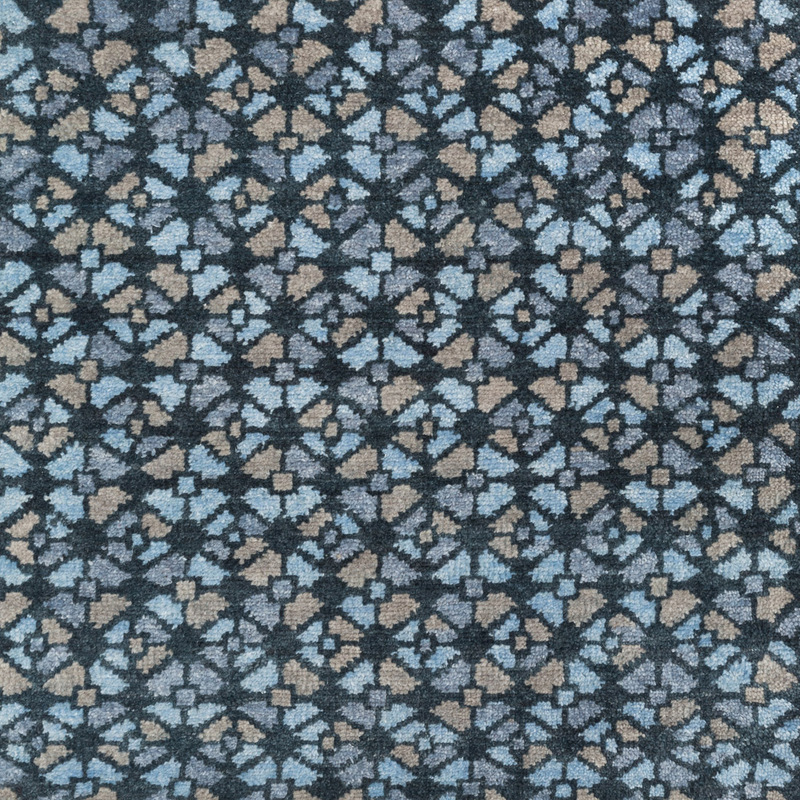 Shown above in a Turkish knot construction so called Oushak quality, ‘Trellis’ once again shows its – and the entire collection’s – versatility by interject a seemingly random placement of coulored elements. Of course the rugs in the Galbraith and Paul Collection are not the only carpets sold by Holland and Sherry. Kate and Wayne oversee a comprehensive selection of rugs and carpets in a variety of textures, designs, colours, and materials (including a luxurious to the hand Mohair Shag) available to the design trade with all of the various custom and made to order options one would expect from a bespoke textile company. Though not in any way basic, these form the basis of Holland and Sherry’s rug offerings, whereas Galbraith and Paul adds the ‘seasoning’ as Liz says. The Galbraith and Paul Collection for Holland and Sherry is available through Holland and Sherry Interiors Showrooms the world over and may be customized to your specific requirements; pricing is available from your Interior Designer. Please visit Holland and Sherry for more information and as you do let these parting words from Jonathan be your inspiration: ‘There is something very comforting and exciting about these designs all at once. Just like old friends with new stories…’ Enjoy! Next Post:Domotex Carpet Design Awards 2016 Un-Official Selections!